Hydrex has a variety of fuel storage and distribution solutions that are predominantly used on mines, industries and municipalities that are located in remote areas. We cater for the off-loading, filtration, storage and pumping of the fuel to the desired usage location. Temporary and smaller systems typically use fuel bladders for storage, while the more permanent sites will generally use a fabricated steel tank for the storage with a fixed loading and off-loading arrangement. Metering, anti-theft and user / machine accountability are integral part of our design process. Hydrex® Container sized distribution and storage tanks. Hydrex manufactures container sized high volume diesel fuel tanks. These are transportable in open top containers or flatbed trucks allowing for the efficient transport of diesel tanks to any site. Tank base supports are shipped inside the tank and are placed into the bund when installing. This design allows for the most economical shipment of a 55-65KL storage tank where transportation to site is a large cost factor of the total project value. 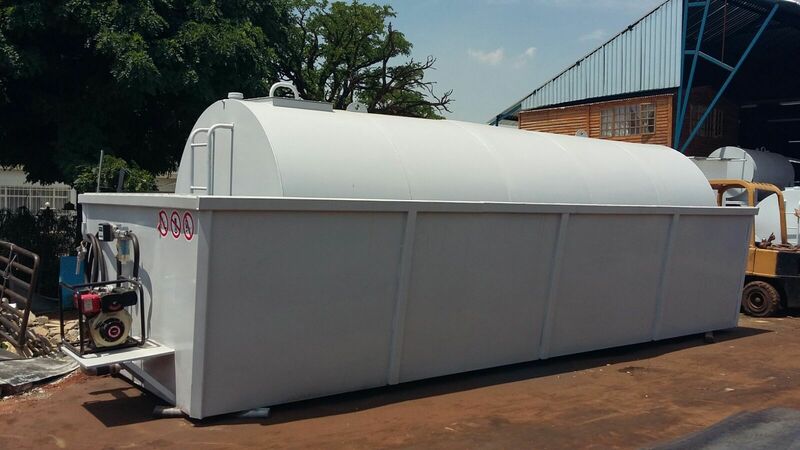 We offer a range of standard round diesel fuel tanks and also offer refurbished tanks to our clients. The tanks are generally skid mounted for placement into an above ground bunded facility. All tanks can be in inter connected with customised pipe work where required. Hydrex® Site fabricated high volume structural steel fuel tank. While site fabricated tanks have a higher manufactured costs, they are able to store larger amounts of fuel. 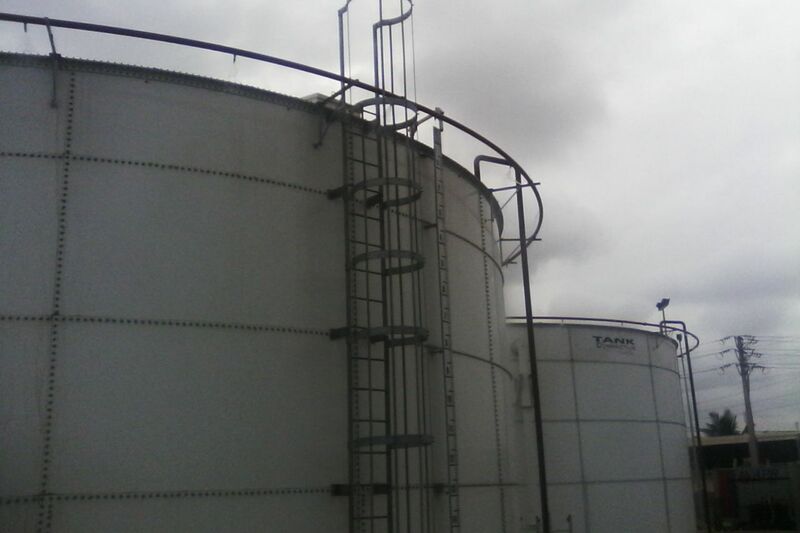 Fabricated tanks have capacities of between 500KL and 2 ML. We cater for all accessories including pipe work, fire suppression, filtration and pumping of the fuel to the desired location. Hydrex® Pumps, filtration and fabricated pipe work. At Hydrex we are able to assists with all forms of above and below ground pipe work and pipe lines. Our systems are typically fitted with flow meters, filters and pressure relief valves and systems. Filtration is a critical component of fuel storage and distribution. The longevity of your mining or power generation fleet is largely determined by the quality of fuel that is distributed to the consumption point. Hydrex® Fuel dispensing, valves, maintenance and forecourt design. Designing work flows, off-loading and fleet access to your fuel depot is not to be taken for granted. We offer our clients tailor made solutions based on our past experience. Flow rates, pump sizes, peak demand off-take volumes are important inputs when it comes to forecourt design and dispensing. The Hydrex® fuel bladder range is produced from a specially formulated fuel resistant material, suitable for petroleum products. Our fuel bladders are fitted with re fuelling points, breathers, dispensing points. Water traps and drains can also be added. The general sizes are 5, 10, 20, 30 and 40 KL systems that can be used on a stand-alone or inter-connected basis. Pipe work, filtration, dispensing systems and bunding solutions form an integral part of the entire solution. All fuel bladder material is based on US military specifications.